Everything was easier years ago. Less channels, less shows, less episodes to follow. Nowadays the offer is infinitely broader and it would drive you insane if you had to remember every upcoming episode from each of the shows you follow. Squire already helps you to know about upcoming episodes. In the episode list you can see how many days left for the next episode airing. But we think this is not enough and we’ve worked to improve things. From now on you’ll be able to receive specific messages about upcoming episodes for the shows you’re following and other kinds of information we know will be relevant to you. Don’t be afraid, we’ll be respectful. We know you don’t want a stream of notifications at any time that bother you for no reason. If your notifications are not showing up you may have them disabled in your iPhone. To activate them just tap into Preferences/Notifications/Squire and enable notifications. Most of the time spent in Squire is done on video player. It’s a small undervalued element but also a tremendously important piece that should always work. The Squire player supports most popular formats nowadays. In the latest update we keep improving it so that its operation is more agile and efficient. We have always opted to use the same interface as in the system player. The user does not have to learn anything new. The new iPhone X and the new iOS 11 system came with a totally new interface for the video player. And this complete redesign has already been adopted by Squire. Not only we have worked on the interface but we have also updated the player core, with fixes that solve iOS11 bugs. Squire has been supporting Plex for many months now but we’re aware that it was a partial support and was far from being perfect. 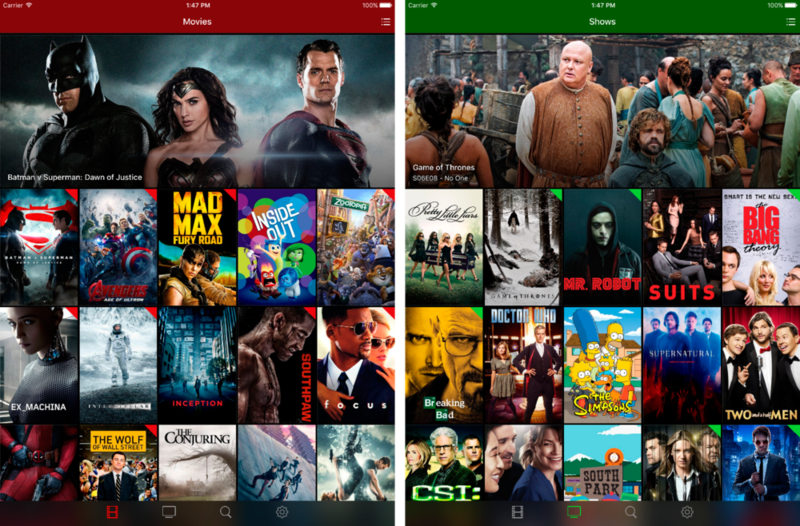 Our latest update has been a big jump and we think now Squire can be considered a great Plex client too. In addition to being able to use your local server, Squire now also lets you enjoy your shared libraries or your Plex Cloud. Better yet, why not everything at once? Forget about selecting servers or typing IPs and ports manually. Just connect your Plex.tv account to Squire and we’ll take care of the rest. All your movies and TV shows from all your connected servers will be added to your Squire library. All Plex support has been re-written from te ground up. We’ll keep on improving our system with each update. My most sincere thanks to our beta testers, specially Richard, Brice, Essam and Taylor. It’s no use for a library to be organized, clean and updated if you’re not able to keep up with new shows and movies you could watch in the future. With Squire we want to solve this in various ways. Increasingly we’ll be implementing new features towards this. The first and most obvious will be a “News” section. As we mentioned in previous posts, if you’ve become a premium user you’ll be enjoying new features progressively. Here’s a new advantage to becoming premium… and it won’t be the last. Our new update for iOS is focused on iPad features. Until now we were dissatisfied with what we offered. Honestly, the iPad version did not keep a consistent line with what's available for iPhone. While both were Squire they looked like different apps. If you mainly use squire for iPhone you'll feel right at home with the new iPad version. It works as intuitively, it feels familiar and it takes advantage of the bigger screen real state provided by iPad. If iPad is you main device for using Squire get ready because this update is a huge step forward. Now you’ll be a bee to rotate your iPad and use Squire in either orientation. Navigation will be more straightforward, adds support for iOS 10 etc. We’re aware there are still things to improve. We’ll keep on sweating the details you’ll be able to enjoy in further updates. Cloud service to allow the syncing of playback position, TV show tracking and Watch Later/Favorites list state. New local data persistence system. First version to support Plex Media Server in local networks. Right now it might not look like a big deal for everyday use, but in the near future it’ll help deploy frequent and important updates. The most relevant feature is perhaps the addition of Plex support announced in previous posts. 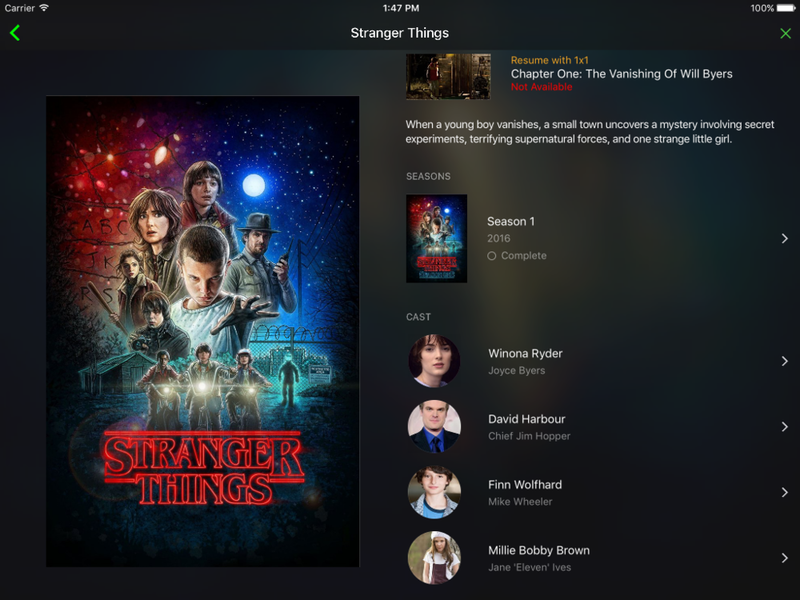 This is the first version that supports Plex Media Server locally and, even if we have been testing Squire for months, it’s not until now that the app faces thousands of Plex libraries installed in multiple devices, each one with its own peculiarities. We’ll need your help and greatly appreciate all reports sent to support@squireapp.com. We hope there are no major problems. Thanks for your patience. The pace of updates to Squire these past months has been pretty steady. With a new version out every few weeks the product has been growing healthy. During this last month, however, updates have taken a break and we’d like to explain why. As you may know, in order to use Squire today you need a Mac computer running Squire Helper. Many Windows and Linux users have expressed to us their desire to become users too. It’s kinda sad not to be able to offer this possibility and we’ve been working hard to support Plex Media Server as an answer. Do you have a Plex Library in your Windows or Linux computer or even running on a NAS? You’ll be soon able to access and manage that within Squire. Do you have a library in Squire Helper and another running in Plex Media Server? Don’t worry, Squire will merge both magically under a single interface without any hassles on your side. Now, you could ask yourself, if I can use Squire without Helper running, what will happen to all my data? Where will my Watch Later lists go, or the TV shows I’m currently following? When I return to that episode I was watching yesterday, how will Squire know the point to resume? Until now all this data was stored in Helper but now that it’s not essential we’ve been compelled to change that paradigm. If you turn off Squire Helper, you will have the Plex Media Server library. However, how do you store the library data? Squire Helper will not be the data source for your library. We have instead created a cloud service that will slowly grow to sync all your data, no matter if you use either Plex Media Server or Squire Helper, be located in your home network or a friend’s… All without having to have a Mac available at all times! New flow. Manage all your library data everytime and everywhere. We keep on improving the app week after week. This update brings many small improvements that’ll make you feel more comfortable using Squire. We also bring an all-new Settings view where we’ll be adding features so you can customize Squire to your like. For starters, you’ll be able to configure your subtitles appearance and activate/deactivate soundtracks music from movies. - Configure size, font, color and subtitle background to adapt it to your TV screen, customize them to your like (see image above). - The gesture used to open and close the upper menu in the video player behaves more consistently with the standard system gesture. - Fixes a small bug when marking episodes as watched. - Fixes small bugs regarding environment sound management. - Now the app behaves more consistently when entering and coming out of background usage. - Fixes other minor bugs. When you devote so much effort to something there’s always the fear of things not working out and receiving negative feedback. I am perfectly aware that Squire still needs much work, there’s lots of improvements to be done and new features to be developed. However, the feedback we have gathered from you, the end users, has been really incredible. The contribution to ideas, comments and suggestions has been constant. And when things go wrong I’ve always met at the other side of support plenty of helpful people with lots of patience that put me on the right track to find the bug that was needed to be ironed. I think these thoughts deserved a post. I just wanted to express a sincere “thank you”. Starting today you can find a new update to Squire for iOS. The new features added some weeks ago to the AppleTV version can now be enjoyed on your iPhone too. You can browse the cast from your favorite movies and TV shows, look for similar content and many other visual improvements. We have also improved video rendering and made some visual and stability enhancements. We take care of each version with great attention to detail, so the iPad version is not yet ready with these new features but rest assured we are working hard to get them in your hands as soon as possible. If you have "House of Cards" in your following list, congratulation!. Netflix has just brought online a new House of Cards season four teaser. All 13 episodes are set to hit the streaming service on Friday, March 4. And more surprises. The HBO officially released a cryptic teaser of “Game of Thrones” Season 6. The sixth season premiere of “Game of Thrones” debuts April 24. Considering this is the year’s most popular TV show in the US, Hollywood doesn’t miss the opportunity to showcase new scoops on the best upcoming features. It’s always been clear to us that Squire had to be a tremendously simple application with a clean interface. These past weeks we‘ve been working on adding more information to enrich the browsing experience and help you choosing a suitable movie or TV show to watch. We are happy to present our next update. With it you’ll be able to browse movies, lookup Rotten Tomatoes ratings, learn more about your favorite actors and gather basic recommendations of similar movies and TV shows. Countless visual and performance improvements on the interface. Improved compatibility with Helper settings. The app has already been submitted to Apple and we cross fingers so you can soon enjoy it on your Apple TV. Until now Squire has been using the native iOS media player. This means that Helper must convert video on the fly and send it in the correct format to your iPhone, iPad or Apple TV. This approach has many advantages but it also means that Helper has to work continuously and make lossy video conversions. The upcoming Squire update will showcase a whole new media player, so realtime conversions will be a thing of the past. Devices will show an optimal picture quality, faster load times, better subtitle support and better overall performance. Also expect many other enhancements.